Thanks Midas, I've been looking at that recently, but unsure how the update works. Does it check, d/l and install any updated apps? Also the file-system seems a bit messy for my liking, maybe just me, but at least with PA.com apps you simply chuck your apps in the folder and the menu sees them. Need to do a bit more testing to find out how things work with SyMenu before switching. Nice App! Shame it you can't add PortableApps.com apps to it and update them automatically. Would also be good to add a tray menu for launching apps and performing update checks. @Ruby: Relative paths to subdirectories (e.g. ".\nirsoft") work for me, but not parallel directories, as in your example. Nice! Provides integrated access of Sysinternal, Nirsoft, and Windows Utilities from an easy to use interface. The auto-update feature is appreciated. Every time I download anything from Nirsoft Avast, Malwarebyes and spybot S&D all get upset and say it's malware. In every case it alerts me that certain applications are trying to start on their own so i'm a bit hesitant to use much from that site. The Nirsoft Launcher is also able to launch Sysinternals, or anything for that matter, and it's completely portable. To make the standard download portable, change the default local path locations to " ./folder of your choice "
ex: make a new suite folder called Sysinternals & one called NirSoft in the same folder where the wscc.exe is located. Now just change the default local path location to .\Sysinternals & .\NirSoft for each suite local path. 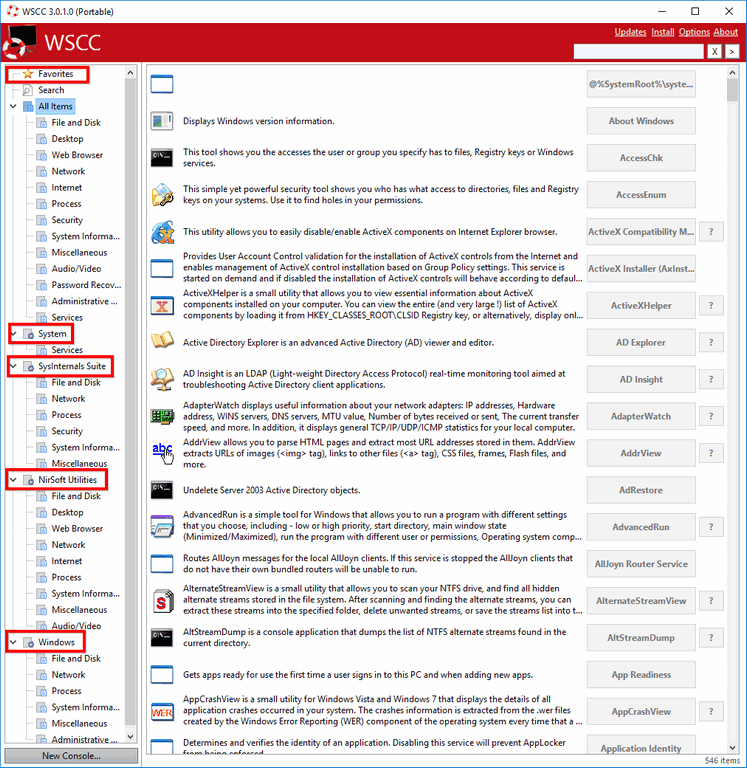 Now you can auto update the suites and the WSCC main program. Hey, this is nifty! Looks like a take on Nir's own NirLauncher, except that this wscc is a bit more friendly. I would like the tooltips to appear not as tooltips, but as info in a docked panel. I would also like to see the icon view with "small icons." I would also like to see the control panel show as a folder in the treeview. This app has a feature which will update/install all the newest versions to the set folder for all nir programs and all sysinternals programs. It is really a good thing! Kudos!